GLAF has designated Dr. Rob Jagnow, GLAF Director, as its representative for the International Conference on Human Rights called the "Right to Be Different" Conference. Dr. Jagnow is also the Chairperson for the Sport Sub-Committee and the Outreach Advisory Committee for all sport related panels at the International Conference. In doing so, GLAF, along with other participating organizations will make history in defining the charter of the Montréal Declaration. We are now calling for proposals. Want info? 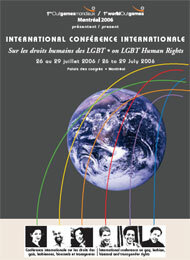 Email us at montreal2006@glaf.org. The Conference will begin on Wednesday 26 July 2006 with an opening address by an internationally-recognized personality during a gala dinner given to officially inaugurate the Conference. Consult the preliminary programme here. The following morning at the Palais des congrès, Montréal’s convention centre, the first plenary session will be held, bringing together some 2,000 participants. The Co-Presidents of the Conference, Ms. Joke Swiebel, former Member of the European Parliament, and Professor Robert Wintemute from the School of Law at King's College London will lead the opening discussions. Over the next three days, Conference participants will be offered four more plenary sessions, featuring a number of internationally-renowned keynote speakers, and will be able to choose from up to 250 workshops (up to 50 simultaneous workshops during each of five workshop sessions), which will deal with the many aspects of the Conference themes. Finally, on Saturday 29 July, there will be a lunch to close the Conference, which will include the adoption of the Montréal Declaration. Register NOW using the GLAF Affiliated Member Code: GLAF. Enter this code as you get on "My Finance" page, before proceeding to your paiement.